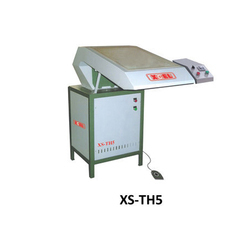 Being a renowned name in the industry we are offering top quality range of Thread Sucking Machine. The range of machine is developed by using superior quality raw components and is extensively known for best functionality and less maintenance. The machine is well-equipped with best features and ensures continuous functionality. 1) Girison Unique Thread-Sucking Machine Absorbs All The Loosely- Attached Threads Stuck On The Garment After Stitching. Thread Sucking Machines that we offer are enabled with fully automatic action to ensure clean working area. Average production capacity in an 8-hour shift is more than 2000 pieces. It can be used for a variety of garments ranging from shirt to skirts of all sizes. • Once your garments are stitched, LAMAX ensures that they look their best. This inimitable unique thread sucking machine absorbs all the loosely attached threads stuck on the garment after stitching. • Pneumatic operation ensures that the process of thread sucking is efficient. In order to meet huge market demands, we are involved in offering best quality of Thread Sucking Machines. This Thread Sucking Machines are highly appreciated for their various uses in suitable applications. 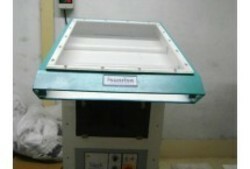 Further, the offered Thread Sucking Machines are available in market at industrial leading prices. - Size of funnel: 21" x 6" x 45"
The average daily capacity in an 8-hour shift is 2000 pieces, whereas if this operation is done manually, it would require 4 people and 24 hours to do the same. The accumulated loose threads inside the machine can be removed by simply opening the front door.